As we are currently making preparations for G-whizz to have her annual out of water servicing on the slips at Michael Bartley Shipwrights, I was looking back through the records and came upon this photo from a couple of years ago. It shows the G-whizz’s sail drive with the prop removed. The line looks strong enough to hunt for white pointers, we have no idea when or where we got it. We are grateful that no damage was done during the “Capture” or subsequent to it. 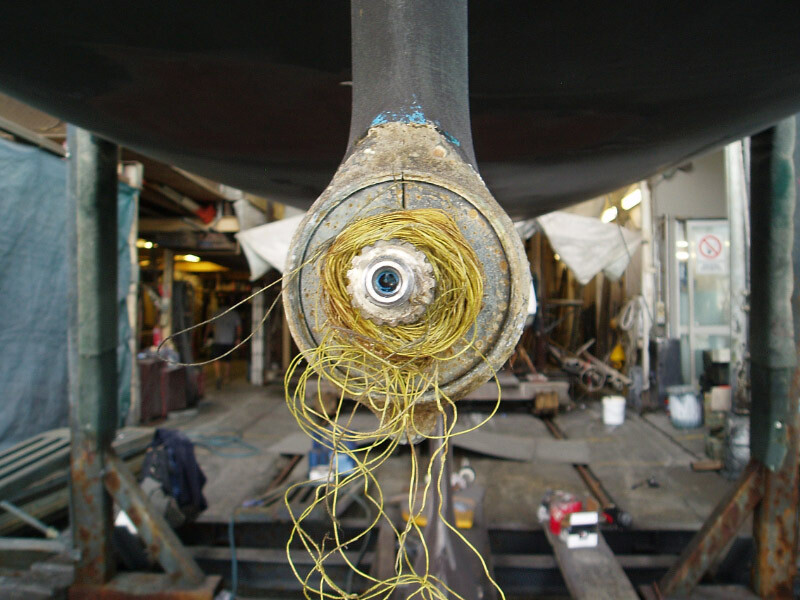 I do not have a photo to show, but I am assured that it was almost impossible to see when the prop was still fitted. As Michael said at the time. “I wonder if the fisherman is bragging about the Elan 340 that got away?”.